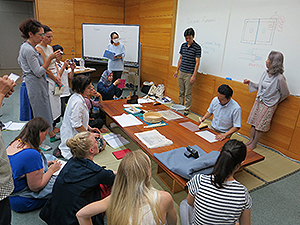 International Course on Conservation of Japanese Paper took place from August 29th through September16th, 2016. This course has been held jointly by the Tokyo National Research Institute for CulturalProperties (TNRICP) and theInternationalCentrefor theStudy of thePreservation and Restoration ofCultural Property (ICCROM) since 1992. The course aims to disseminate techniques and knowledge on the preservation and restoration of cultural properties made of paper in Japan so as to contribute to the protection of cultural properties overseas. In 2016, among 64 applicants from 36 countries, we invited 10 specialists in conservation, each of them from Lithuania, Poland, Croatia, Iceland, South Korea, New Zealand, Egypt, Spain, Belgium and Bhutan. The course consists of lectures, practical sessions and a field study. The lectures covered the overview of the protection of cultural properties in Japan, the protection system for intangible cultural properties in Japan, restoration materials and their basic science, and the tools for restoration. The practical sessions were comprised of mainly restoring a paper object and mounting it to a handscroll, and were conducted by restorers from a certificated organization holding “soko” (restoration technique based on traditional mounting) which is selected as Techniques for the Preservation of Cultural Properties by Japanese government. In addition, the participants learned Japanese-style book binding, and handling a folding screen and a hanging scroll. As the field study, the participants went to Nagoya, Mino and Kyoto cities to visit producers of handmade Japanese paper, the stores selling restoration materials and tools, historical buildings decorated with cultural properties such as wall paintings and hanging scrolls, a traditional restoration studio, and so forth. On the last day, the participants exchanged opinions on how Japanese paper is used and issues in each country. We expect the participants to gain a deeper understanding of not only Japanese restoration materials and tools, but also related knowledge and skills through this course so as to apply them to restoration of their cultural heritage.